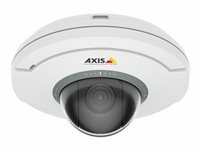 AXIS M50 PTZ Dome Network Camera Series are affordably priced pan/tilt/zoom cameras. They are perfect for remote and discreet monitoring of indoor areas such as stores, banks, hotels, office lobbies, restaurants and warehouses. The vandal-resistant models can be used in those areas subject to vandalism. 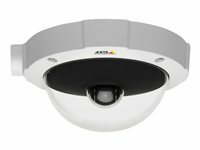 Discreet design with broad coverage AXIS M5013 PTZ Dome Network Camera is a palm-sized pan/tilt/zoom camera, affordably priced for remote and discreet monitoring of indoor areas. It's perfect for getting an overview of a store, for checking if shelves are stocked and items are properly promoted, and for getting customer behavior information needed to increase sales. Other sites suitable for AXIS M5013 include banks, hotels, office lobbies, restaurants and warehouses. Excellent image quality and multiple video streams AXIS M5013 provides full frame rate video in SVGA 800 x 600 resolution. It can send multiple H.264 and motion JPEG video streams simultaneously. Protective casing and easy installation on ceilings With an IP51-rating, the camera is dustproof and protected from dripping water, enabling video to be taken even when a sprinkler system is activated. AXIS M5013 is designed for quick and easy installation. The camera is powered with Power over Ethernet (PoE) using a PoE switch or midspan, which eliminates the need for power cables and reduces installation cost. Audio support and intelligent capabilities The built-in microphone enables users to listen in remotely and audio to be recorded. Audio detection allows unusual sounds or noise detected during off-hours to trigger alarm events. The microSD/SDHC card slot enables several days of recording on a microSDHC card. Cost-effective camera with broad coverage AXIS M5013-V PTZ Dome Network Camera offers ±180° pan, 90° tilt and 3x digital zoom. It is affordably priced for remote monitoring of indoor areas such as schools, train stations and warehouses. AXIS M5013-V provides full frame rate video in SVGA 800 x 600 resolution. It can send multiple H.264 and Motion JPEG video streams simultaneously. It's perfect for installations above a window or entrance under the eaves overlooking the exterior of a building, ensuring no intruders access the area without the knowledge of the owner. AXIS M5013-V is also ideal under ceilings at airports and other semi outdoors places where there is a risk for vandalism. Protective casing and easy installation on hard ceilings With an IP66 rating, the camera is protected against the ingress of dust and high pressure water jets from any direction. The camera is also IK10-rated for protection against impact and vandal acts. AXIS M5013-V is designed for quick and easy installation on hard ceilings. 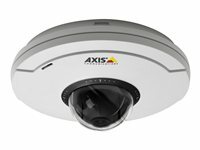 AXIS M5014-V PTZ Dome Network Camera offers ±180° pan, 90° tilt and 3x digital zoom. It is affordably priced for remote monitoring of indoor areas such as schools, train stations and warehouses. AXIS M5014-V provides full frame rate video in HDTV 720p resolution. It can send multiple H.264 and Motion JPEG video streams simultaneously. It's perfect for installations above a window or entrance under the eaves overlooking the exterior of a building, ensuring no intruders access the area without the knowledge of the owner. AXIS M5014-V is also ideal under ceilings at airports and other semi outdoors places where there is a risk for vandalism. Cost-effective camera with broad coverage AXIS M5014-V PTZ Dome Network Camera offers ±180° pan, 90° tilt and 3x digital zoom. It is affordably priced for remote monitoring of indoor areas such as schools, train stations and warehouses. AXIS M5014-V provides full frame rate video in HDTV 720p resolution. It can send multiple H.264 and Motion JPEG video streams simultaneously. It's perfect for installations above a window or entrance under the eaves overlooking the exterior of a building, ensuring no intruders access the area without the knowledge of the owner. AXIS M5014-V is also ideal under ceilings at airports and other semi outdoors places where there is a risk for vandalism. Protective casing and easy installation on hard ceilings With an IP66 rating, the camera is protected against the ingress of dust and high pressure water jets from any direction. The camera is also IK10-rated for protection against impact and vandal acts. AXIS M5014-V is designed for quick and easy installation on hard ceilings. The network cable may be routed in three different ways: routing the cable through a conduit; wrapping the cable around a designated cable track; routing the cable through the ceiling. The camera is powered with Power over Ethernet (PoE) using a PoE switches or midspan, which eliminates the need for power cables and reduces installation cost. See it all - and see it clearly AXIS M5055 gives you good, detailed video with 71° horizontal field of view. PTZ functionality lets you benefit from sweeping overviews and zoom in to get the details. Built-in analytics AXIS M5055 provides even more functionality and versatility thanks to these built-in analytics. Scream detection - an event is triggered when the built-in microphone detects a scream in the camera's proximity.